The old buildings were often drafty, and the space conditioning was often uneven. But the point isn’t to repeat the past in fact, just in concept. New techniques for air sealing and a better understanding of an effective balance between building fabric and building services creates a new opportunity to work out lasting patterns for Canadian cities that can see annual temperature swings of over 70°C. As new constructed and/or renovated buildings become more energy efficient and since most designers base their core design strategy on lowering heating demand (which is completely right and wise) during the 8 months a year with a heating demand, they often forget to address the cooling growing demand. We live in a heating dominated climate, meaning that it’s colder outside than what we want inside for most of the year. How have we come to the decision that cooling is a bigger problem than heating? Increased use of early hourly energy modelling has identified overheating as a potential problem in highly insulated buildings. This is not new. Issues with overheating showed up with the Natural Resources Canada (NRCan) Advanced Houses program in the 1990s, but the habit of focusing on heating is deeply ingrained in the Canadian building industries. The Passive House Planning Package (PHPP) also follows summer comfort very closely and identifies summer overheating as a challenge. Our experience has shown that conserving heat can be achieved with fixed materials and no moving parts, but cooling a space conventionally requires electricity, cooling equipment, maintenance, and an equipment replacement cycle. Finding a passive way to deliver cooling services would be more resilient, as well as less costly for operations. Today's Buildings Envelopes (whether residential, commercial or institutional) are more insulated and more air tight. In the recent years, the demand for more natural lights, open spaces, high ceilings, smart homes is on the rise in an exponential trend (especially for younger generations). The 2010 Version of Canada Building code is more stringent, in terms of envelope energy efficiency and air tightness than the 2005 Version. the 2025 version of the CNB code will require that all new constructions in Canada to be NetZero Energy ready and in 2030 the CNB will require that every new construction in Canada to be NetZero. Heat generated during winter time, escapes to the outdoor through Roof, Walls, Windows, Doors, and Floor Slab. 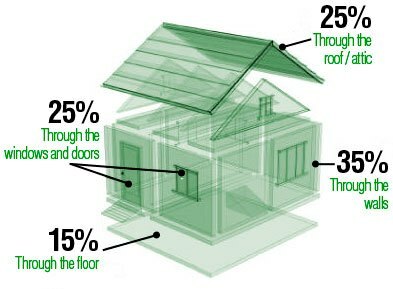 As Building code require higher insulation values, Internally generated heat in the winter (such as heat from lighting, cooking equipment, electronic devices) and Externally gained Heat (such as Sun infiltrating through windows, etc...) will contribute to heating the indoor spaces and to lower heating demand in eight months out of twelve every year. What became an advantage in winter is a disadvantage in summer. Tighter building's envelope means trapping humidity in summer (humidity is generated by occupants and occupants activities such as cooking, washing, etc... latent loads) which is a major discomfort even when outdoor temperatures are moderate. Also having a more energy efficient envelope will trap internally generated heat from different sources (Humans, lighting, electronics, etc...). Despite the fact that LED lighting are much more efficient than conventional lighting, the internal load trend is one the rise due to the explosion in adding more electronics (such as iPads, smart phones, cameras, security systems, etc...). 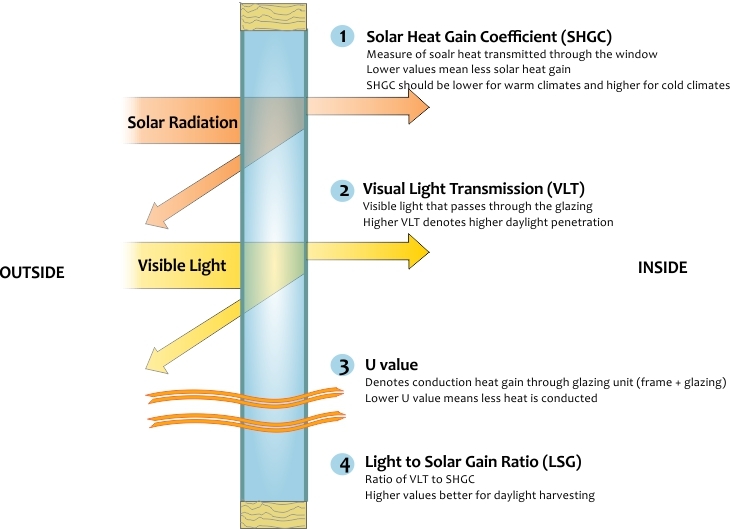 To Maximize winter heat grain from the sun and minimize heat loss from the indoor, Architect and designers tend to specify Glass with Lower U value, High VLT value and relatively high SHGC (to benefit from passive heating during sunny winter days). When indoor temperature is almost equal to outdoor temperature, Lower U Value means that a big portion of internally generated heat will remains inside thus increasing further the indoor temperature and making internal comfort worse and worse. 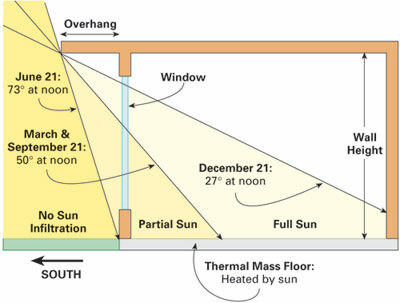 During Sunny days and with relatively High SHGC value, a bigger portion of sun's radiation will enter the house and with smaller U value, this heat remainS trapped inside the house. With a Tighter Building's envelope, internally generated humidity get trapped within living spaces thus increasing indoor relative humidity to an uncomfortable level. Higher relative humidity will generate a dehumidification demand (which is translated into a higher latent cooling load). higher latent cooling load requires lower cooling coil saturation temperature which can be translated into a higher power consumption (There is a positive correlation between Direct expansion cooling equipment power consumption (KW/Ton Value) and Latent load) . In old building, with no insulation under slab, Slab on grade acts in extreme summer conditions as a heat sink. This means that a sizable portion of the internally generated heat or externally gained heat in summer, gets absorbed by the relatively colder floor slab. Nowadays Building code requires a minimum of R7.5 insulation underneath floor slab. This value is projected to increase with the future revisions of Canada Building Code. 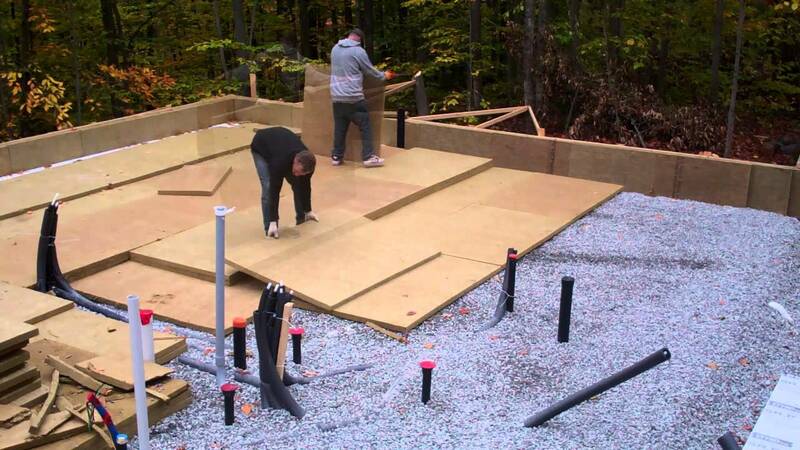 Highly Insulated floor slab can no more act as a heat sink and will contribute to the phenomenon of trapping heat within living spaces in summer. Canada Building Code energy efficiency requirements as well as occupational human behavior will not be challenged in this section of the Blog. Compliance with such requirements is an obligation for every building designer. The search is now on for Canadian approaches to low-energy cooling. Just throwing air conditioning at the problem works, but commonly causes difficulties keeping within the energy efficiency or sustainable development strategy. Inevitably, it also leads to the major feature of all building elevations being the condensers for split system air conditioners. A passive solution would be cheaper to run, quieter for the neighbors, and much better looking. The answer will always be site dependent, but it likely will include contributions from all design disciplines. An overhang, or some sort of solar control or solar shading, is a crucial element in passive solar design because it blocks the sun’s heat energy when it is not desired. Because the sun travels different paths across the sky in the winter (low) and summer (high) time, an overhang can be constructed to utilise and manipulate the heat energy from the sun. In Montreal for example, Sun has a tilt angle of 28 degree in January and 86 degree in July. So the Overhang will block the sun from entering the house in the summer and will allow it in the winter (Passive Solar Heating). This reduces the nominal cooling load as well as Cooling/Heating annual energy consumption. The logic behind the capillary tube is to eliminate internally generated load locally (with Ceiling Tube absorbing heat accumulated at ceiling level) and to also eliminate wall heat gain before heat gets into the indoor spaces. it's a promising approach: radiant cooling using cool, not chilled water and radiant panels, or capillary mats embedded in ceilings. Cool and not chilled water circulate inside the mats pipes (at temperature higher than indoor space dew point temperature) and absorb accumulated heat at ceiling level. Capillary mats can also be installed in walls and floors, doing the same job but for externally gained envelope load. Applying the above strategies by having two kind of equipment, one for cooling air and another one for cooling water won't be cost effective for smaller to medium clients. Traditional Air to Air Heat pumps can provide cold air for cooling but can neither create cool water for capillary tube mats nor create chilled water for dehumidifcation. Air to Water Heat Pumps with enhanced vapor injection (EVI) technology can provide chilled/Cool/Hot water for the above discussed measures and can also provide hot water for domestic hot water production. Available in 2, 4 and 5 to 6 Tons capacity, they can cover a wide range of medium size residential buildings, running at outdoor temperatures as low as -25°C. For larger commercial buildings Air cooled heat pump chillers with the EVI technology are available for capacities as large as 200 Tons. Multiaqua has a simultaneous heating an cooling Air cooled Chiller that can provide chilled/cool/hot water at the same time. It's more expensive than Air to Water Heat Pumps but with Higher energy efficiency. It's only available in 5 Tons capacity. Terminal Heating and Cooling Units are also available for combination with Air to Water Heat Pump or Air cooled mini chillers. Hello Chad Peters, yes building codes are expected to be more stringent in the future. A feasible option will be to circulate cool water in heated floor slab in the summer so slab keeps acting as a heat sink. Same can be done for ceilings with capillary tubes. Hello Sarah-Jane Cabrera. Renewable energy prices keep falling down. Yes they are trendy for now, but they will become a commodity in the near future. Changes to Canadian building codes will continue to shape future construction and energy trends. We will continue to see higher requirements for insulation values to prevent lost energy and more efficient buildings. People need to consider the effects of seasonal changes as well. What’s advantageous in one season can be a disadvantage in another. How can you measure your estimated savings from things like capillary walls, ceilings, and fans, or insulated slabs? I have no doubt they work and are usually worth it, but I wonder if the investment would be cost effective in every case. Hopefully newer buildings are setup with these things from construction.